Well, in 3 months time anyway . . .
LOL, and naturally out comes the 'balloon" explanation, which I would buy except balloons do not take off at great speeds and make sharp turns. What should happen is a repeat of this event at a school packed with kids and thier mobile phones! ‘Big Brother’ would probably come in and confiscate the lot under the guise of ‘national security’… just like they did with the Westall teacher’s camera. Of course the reality is that just wouldn’t work today as any digital photos would be shared with social media, family and friends almost instantly! The Westall mass sighting back in 1966 remains one of the best documented Australian UFO cases, mainly because there were over 200 witnesses who watched the craft land and take off again. The YouTube link given is not the best quality upload. The original is of TV broadcast quality. I personally know the director and cameraman who made this program. A quick search on YouTube reveals many more accounts of this suburban UFO mystery. Thanks for the ‘heads up’ on the anniversary, Dave. Only hope it promotes the release of some new information. Mind you, the story right now is very impressive! It ranks right up there with Australia’s best ever reports. Off the top of my head, other significant Australian UFO events were the Tully swamp nest and craft observed by farmer George Pedley also in ‘66, the disappearance of Frederick Valentich over Bass Straight in October 1978 while he was in contact with the control tower and the Knowles family’s experience on the Nullarbor, perhaps only for all the media publicity it received. Ok... what other multiple witness cases are right 'up there' ? The Father Gill encounter comes to mind, but that took place in New Guinea. What’s needed in Oz is a Phoenix style of event where over 10,000 people, including the Governor of Arizona, watched a huge boomerang shaped craft estimated from 1 to 2 miles wide fly low over the state. Or how about a good old fashioned crash…? Something to rival the Roswell impact down under would really stir the loins of Aussie researchers! Searcher wrote: ‘Big Brother’ would probably come in and confiscate the lot under the guise of ‘national security’… just like they did with the Westall teacher’s camera. Of course the reality is that just wouldn’t work today as any digital photos would be shared with social media, family and friends almost instantly! For a long while I'd had another 'Westall' YouTube link that was better, but when I went to view it again it had been deleted. The Valentich story is made also the more amazing by the associated accounts of UFO sightings in the same general area and at about the same time. The Father Gill New Guinea incident is presently getting another airing at http://ufocon.blogspot.com.au. Was'nt there a multiple witness case where three cars pulled over to observe a massive UFO land in a field nearby in country Vic. Top find, Yowie88. Definitely a very strong and scary Oz CE4 case! Good to revisit it. Three different groups of people all experienced this sighting at the same time. And a few had strange physical markings on their bodies to back up their stories. Kelly Cahill comes across as lucid, intelligent and believable. She clearly recalled the encounter and the alien beings that came towards her. I know the area well as one of my best mates as well as my sister and her husband live close by. a bit about this in the past with Yowie 88 as others have as far back as 2010- SAB88. So I don't want to go over old ground but I thought I say what sticks in my mind. and the Ariel school incident-1994 in Zimbabwe still interest me. to give both these incidents a special kind of gravitas. an idea of being aware of the earth and environment....'and what humans are doing to it' . Strange message ? but it helps to read one incident off the other. but then again it was the 60's. G'day Tuckeroo. Good post. Nice to read about your opinions on those well documented UFO reports. According to MUFON, there are around 600 reported sightings of UFOs every month around the globe. That's over 8000 per year. Plenty to chose from there! Click on the chart below. And just like the few Yowie sightings we get every now and again, no doubt a high percentage and go unreported for very obvious reasons. Thanks for the link Dave. Thats a serious coverup. A shame the teacher didnt hide that camera. Did anyone notice the smaller disc off centre attached to the larger disc in the picture the man took a few days before the school incident? Could be that the small disc was what the witness saw on the ground next to the larger one. Probably detachable and powered by the same power source. Sounds like they were in sync from his description of when they took off together. The 50th anniversary of the famous Westall UFO incident has been and gone. The mass sighting took place on the morning of April 6th, 1966. Many of the over 200 witnesses are still alive and keen to tell about the disc shaped object they saw both in the sky and on the ground. This Channel 10 segment is well worth watching. so hopefully out of respect for the witnesses they didn't. Thanks Searcher for posting the ch.10 interviews link. It confirmed for me that there were three not two, craft witnessed that day. the correct picture of what happened. For me, one word can shift context to another place. these things. I’m contradicting myself here because ‘could’ve’ and ‘seemed’, is the basis of a lot of my own speculation. like the other ground crews that turned up after the incident. leaving the Grange area and this activity was only one part of a chain of events that happened that day. Those 5 planes did arrive quickly, even before the ufo’s had left the area. Such a quick response by the military, considering witnesses said the whole event lasted less than half an hour. ground crews to respond...…I don’t think so. I’m splitting conceptual hairs and starting to sound pedantic , so I’ll give that angle a break.………enuff said. picnic area of the Grange. Seems like there is a bit of juice left in Westall yet. Glad you liked it. Those eyewitness accounts are compelling. Interesting about those 5 aircraft getting there so quickly. Facts here are that Moorabbin airport is one of the busiest in the southern hemisphere and is only minutes distant from the Westall school. I know it well, having flown out of there many times in light aircraft and choppers. The sky around the airport is always full of aeroplanes and it is very possible that the control tower has vectored in nearby aircraft to have a look. The UFO may even have been visible from the tower through high powered binoculars. As far as I know, the pilots and any occupants of these light aircraft have never come forward to tell about what they saw. It is a fair bet that the MIB types moved in very quickly on the pilots and others and gave them a thorough de-briefing, along with the usual threats. Just like they did at the school. One of the most intriguing aspects of this case was the school girl who I think touched the craft. She collapsed and was taken away to hospital then just disappeared from the school. It was as if she and her family ceased to exist. Suddenly there were new people in her house and no one knew anything! A high level cover up for sure. Funny they mentioned on sunrise this morning that nasa is heading to alpha centuri to look for signs of alien life. Theyre going to let us know in 20 years when they get there. Lol! Sorry for misinformation. . Not nasa. Its a private thing. On the news again tonite. If you jumped on a the Space Shuttle which has a maximum speed of 28,000 kph and were able the leave Earth orbit and head for our nearest star Alpha Centauri, it would take about 165,000 YEARS to get there!! It's almost impossible to imagine how vast the universe is. We look up to the night sky and see all those twinkling stars looking very close together. The reality is the distance between stars is incredibly vast, as the above example illustates. Im sure youve seen it searcher. Its on the news. Theyre just using telescopes. Its a ten year project. Theres a competition for the best message to send to the aliens as well. I hope they dont send anything offensive. Just to let others know what we're talking about, Yb. Hi Yb. Had a laugh when I read your post about, ‘twenty years to get there’ There’s irony for you. Moorabbin Airport nearby, good point, makes sense. when most students were scared and stayed back at school. Ages mentioned, 12 or 13; older kids of the school, a bit rebellious etc. ............maybe. She seemed to be one of the first to arrive, brave enough; but than why become hysterical and collapse. She may have suffered some kind of electrocution. been planning a move for some time. She stayed home to recover before her parents sent her off to the nuns. Still, it’s mysterious why the family completely disappeared . and what we see is the light reaching us, still showing the planet. Is this correct ? commercial interests have always pushed into the frontiers better than governments do. Does anybody know how to create those light grey quote boxes on these posts ? Light travels at close to 300,000 kilometres per second. Even at this fantastic velocity, the light coming from, say, the Great Galaxy of Andromeda takes around 2.5 million years to get to us on planet Earth. 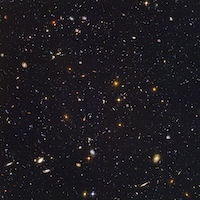 So you are correct in saying that we are seeing that galaxy as it was 2.5 million years ago. And many stars within that galaxy would now not exist. As a matter of interest, this huge M31 Andromeda galaxy is hurtling through space directly towards the Milky Way at about 400,000 kph! The good news is that a collision is not expected for at least 3.75 billion years! There are a couple of different ways. There is a large box that says "QUOTE" in the bottom right corner of every message. Click on that and the entire message is there in a reply box. You can the edit/delete parts of the quote if you want. My preferred way is to copy the quote required from the forum and then paste it into the reply box. Then select it and click on 'Quote" which is 4th from left in the menu box directly above the reply. will appear at the beginning and end and the box will be light grey. Have a play and then check Preview. You don't have to hit Submit if you don't want to. Don't like to say it, but we are getting a bit off topic from the Westall UFO case. It will be just a matter of time before the OP Dave pulls us into line... Tuckeroo... Just create a new topic if you want to ask questions about the universe. Happy to try and answer them for you. Sounds like a screwed up military excersise with the planes close behind. Someones said it already but if military had machines able to maneuver like that then we wouldve seen them bombing something by now. With such a huge coverup makes it look even worse to me. Fair enough Searcher, I was getting carried away with the weave. Just wanted to revive this thread, as I've always had an interest in this case, and I knew there'd be a thread about it here somewhere. You are right, Simon. Indeed a most interesting case! After more than 50 years, this extraordinary mass sighting refuses to go away. High profile american documentary producer James Fox is in Australia doing a conference and interviewing witnesses to the event. He is also offering $100,000 to any military or government officials who will come forward with compelling new evidence. The mystery of the Westall UFO(s) continues. Because of the connection in subject matter, here is a link to (part of?) an interesting documentary about Dr John Mack's investigation of both a UFO and alien encounter by 62 school children in Ruwa, Zimbabwe on Sept 16 1994. Thanks for the link, Cittimani. The Zimbabwe encounter from 2004 ranks right up there with the most compelling of mass UFO sightings. As most will know, Harvard professor John Mack is no longer with us, having passed way to soon at just 74. This eminent psychiatrist and academic was a Pulitzer Prize winner. His well publicised work on alien abductions lives on. It's now 52 years since the famous Westall mass sighting. April 6 keeps on returning and still no one has any convincing explanation for the mysterious event. Today's Nine News site has revisited the sighting. I'm just pleased this compelling encounter will not go away. Journalist Kate Katchor provides a well written overview on the witness reports and the response from relevant authorities. No doubt these official departments have other evidence stored away. Photographs from the teacher's confiscated camera for starters.